If you find the time to watch then send in an email to the studio on Studio@IdealWorld.tv I would love to hear from you. Oh my goodness, it has been ages since I last updated you guys. Since the last time so much has happened and I have been so busy. I am also going to be updating the schedule page. This will include demonstrations that have been booked at various locations where I will be showing how to use the TrimCraft products. The main item is the Bind-it-All Machine. 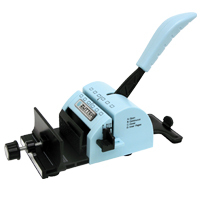 This is a fab bit of kit, it will punch the holes and bind the pages togehter, this will allow you to make your own scrapbooks, notebooks, diaries, address books, calendars, etc., the list is endless. At the £50 – £55 mark it is a considered purchase but well worth it if you are into your scrap book type crafts and like to make gifts to give to friends and family. 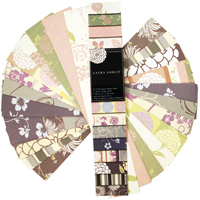 TrimCraft have also brought out the Laura Ashley range, which include papers, brads, sticky ribbons and wait for it … Stamps !! Wow, such a scrumptious lot of products in 2 choices, traditional and contemporary. So, have a look at the schedule page and come along to a demo near you. Sometimes I wonder how my life got so busy, cannot believe how much I have been running around recently!! Besides the Pick of the Week prep, I have been sorting out samples for the Pick of the Day soon. This will be live on Tuesday 8th April 08 at 9pm, with a further 5 live shows at Midnight, 10am, 1pm, 4pm & 7pm the next day on the 9th April 08. If you do get a chance to watch let me know what you think, I would love to know. Other then the TV stuff, I have been busy running workshops and meeting you lovely people, sorting out projects for Lets Get Crafting and organising my diary as it seems to be getting a little full over weekends. I having been putting in dates for TrimCraft Demonstrations at various locations. I will be uploading these dates soon so if I am in your area, please come and say hello.